Vince Cantu and Joe Galloway, both 76, first met each other in third grade in the mile-wide town of Refugio, Texas. After they graduated as part of a class of just 55 kids in 1959, Joe left town to pursue journalism, and the two lost track of each other over the years. Vince and Joe came to StoryCorps in Austin, Texas, to recall the moment they reunited in a place they didn’t expect during the Vietnam War. In November 1965, Joe Galloway snapped this photo of his childhood friend Vince Cantu during the Battle of the Ia Drang Valley without realizing who was pictured. Vince was rushing to pick up the body of an American soldier to transport him home. The photo would ultimately run in several magazines, an illustration of the cost of war. Years after the war ended, Joe was decorated with a Bronze Star Medal for rescuing soldiers during the Battle of the Ia Drang Valley. His is the only medal the U.S. Army awarded to a civilian for actions in combat during the Vietnam War. Joe and Vince remain good friends to this day. Top Photo: Joe Galloway (L) and Vince Cantu at their StoryCorps interview in 2016 in Austin, Texas. 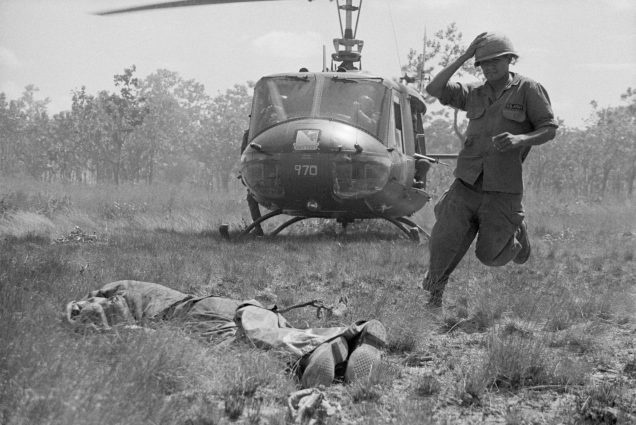 Bottom Photo: Vince Cantu rushes to pick up the body of an American soldier during the Battle of the Ia Drang Valley in November 1965. Photo Courtesy Getty Images. Originally aired February 24, 2018, on NPR’s Weekend Edition. JG: The next time you and I saw each other was in the middle of the Vietnam War in the Ia Drang Valley. You were running full speed across this landing zone under fire to pick up a body of one of your comrades. JG: I was shooting pictures of the battlefield. And after three days in that place, we probably killed fifteen hundred of the enemy all around this little clearing in the jungle. It is very hard explaining war and combat to civilians. The smell of blood in large quantities. The smell of napalm. People burning in front of your eyes. VC: The worst smell in the world. VC: I came home and it was 15 years before I picked up a rifle. I’m glad I went and I’m glad I did what I did what I did, but every night when I go to bed I pray. I even pray for the ones I put down. JG: I’m awfully proud to know you, Vince Cantu.